~ stars, stars and more stars. In fact you need a minimum of 2 heroes and thus a minimum of 2 heroines & goondas with plenty of henchman. Just watching your favorite actor or actors act their way through these delicious messes of movies is worth the price of admission. ~ a generous dash of masala but beware, Bollyweed movies are not just your standard masala fare. Yes, you do get the drama, comedy, fight scenes and tragedy - just on a whole other level. ~ a plot line that borders on ridiculous yet manages to remain coherent by being connected with the most implausible coincidences. ~ fantastic seventies fashion, lots of color in every scene and insane camera angles galore. In fact the visual overload in these movies actually can make the movie enjoyable to someone even if there aren't any subtitles. ~ last but not least it's the tunes. The songs in any Bollyweed movie are the glue that holds them together and the reason the movies are remembered with such affection even after all these years. Yes, you could say that about most Bollywood movies but the music composers of the seventies were experimenting with so many styles borrowed from the West while remaining true to Hindustani filmi music and thus created an altogether new sound. Nirupa Roy's character (aka the eternal mother in virtually every Hindi movie ever made) goes to the mandir with her one remaining child and her sari is grabbed by the missing one. Oh the humanity! The sheer number of coincidences in this movie is just staggering. Stay with me here - the 'good' twin is trying to raise money to buy his mother medicine and has been challenged to a very evil game of quarters to get it. He passes out from the ridiculous amount of straight whiskey he consumes and is brought home by - yes you guessed it - his 'bad' twin brother. After getting the 'good' brother home safely, the 'bad' one is given a book as a reward for his good deed. Unbeknownst to the involved parties they are all related to eachother! My friend Nehal described this as the smallest and most ironic village in all of India. Fast forward a few dozen years and this is where the movie gets really good. Amitabh with a killer outfit does the old 'beat em with a sandal trick because they can never tell a Size 6 from a Size 9' and does this throughout the movie with whistles and cheers each time he does so. And nothing, I mean nothing will prepare you for the fantastic fight scene between Amitabh and Shashi that is depicted below. Not only are the two brothers but Shashi enters the movie wearing an all black leather outfit complete with a cane AND a cape. The great cowboy western score in the background elevates this meeting of our two heroes to something that modern movies can never hope to replicate. Enter Rekha who looks radiant in every scene she appears in and playing a prostitute yet one more time. The song that follows the below exchange between the two is as memorable as the one they did together in 'Muqaddar Ka Sikander' but with far less pathos. We all agreed that night that if we were to ever go to Bombay together to party - it would be at this club where Shashi dons the most excellent undercover outfit EVER to bust Ranjeet's illegal opium den. Mind you, the movie is not even a third over yet the audience has already gotten more than their money's worth. Great tune/great scene/introduction of Parveen Babi (anointed Parveen Barbie by Beth for her dazzling good looks and perfect figure) but I ask you to notice the background in the below scene. They are clearly not in Bombay but these are mere details when you are dealing with a movie of this caliber. Continuity? We don't need no stinking continuity! Through a series of even MORE coincidences we find out that Rekha and Parveen are actually sisters but Parveen doesn't know Rekha is Amitabh's girlfriend. Of course given the fact that Amitabh and Shashi don't know that they are brothers kind of cancels everything out but at least another great bhangra song follows the scene below. This song may be the first time that garba raas (a style of dance unique to Gujarat) was picturized in a Bollywood movie. Oh yeah, the scene below is one in which Amitabh is to kill Shashi but instead accidentally blinds him. Really. To make amends for his botched assassination attempt (it was actually a set up to catch another bad guy and he didn't mean to... oh never mind) Amitabh is asked to join the police force in Shashi's place but to do so he must stop drinking. He asks Rekha's help in doing so and what follows is not just ANOTHER amazing tune but the first (and last) appearance of mini-Amitabh in a Bollywood film. After Amitabh jumps on the wagon of sobriety he teaches the now blind Shashi how to drive a motorcycle (yes really, you really gotta suspend a heck of alot of reality in this movie - a whole heck of alot) and to shoot a pistol (use the force Shashi!). After which they proceed to bust Amitabh's old drinking/gambling dens but not before Amitabh shows just why he is just one of the coolest cats around and does a little dance with the go go girls while the place is being raided. That does it for the screenshots and I didn't even get to the ones where the two brothers hang on to a helicopter for what seems an eternity in order to catch the bad guys or the ones which show how Shashi gets his vision back. 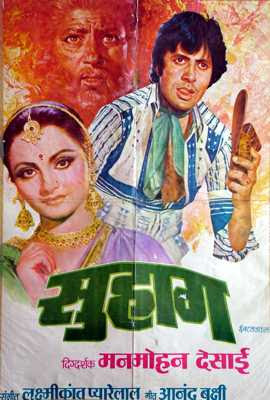 Get 'Suhaag', call over some friends, open some bottles of wine and have some of the most fun you can legally have with this gem of a movie. Originally I was very resistant to the soundtrack of this movie as regular readers to this blog know that I am very partial to having Kishore Kumar songs be a regular part of my Bollywood experience. Kishore was THE voice of Amitabh during this time period so it's still puzzling to me to this day as to why Rafi was chosen to sing. Over the years I have warmed up to the tunes and now count them among my all time faves. The songs for today are Athara Baras Ki by Mohd Rafi and Lata (the one where we are introduced to Rekha) & Teri Rab Ne by Mohd Rafi, Shailendra Singh & Lata (the bhangra song). But I would be remiss if I didn't put my other favorites up as well so click below for the song where we are introduced to Parveen Babi and also the song where 'mini-Amitabh' makes his first and only appearance. Parveen looks more beautiful in her scene driving with Shashi than she has ever looked anywhere else, I think---and that's saying something! 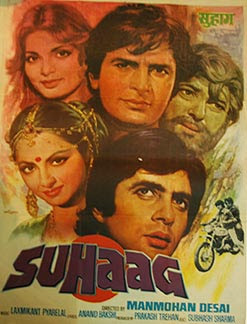 Suhaag is one of the best masala films ever. Anyway. Sanket, I want to watch movies with you and your friends! :) I loved your friend's line about the smallest and most ironic village in India. I think all of Bollywood lives there, doesn't it? HOWWW did Praveen stay in that weird position on the car's windshield????? HOWWW??? I cant get over that somehow- it defies gravity. I have to see more "Bollyweed" films! You watched in the most ideal setting possible my friend ;) I would just go to any of the Indian/Pakistani grocery stores in East End (assuming you are from London). If not, you should be able to get a good copy from ebay or amazon.com - good luck and happy watchings! Bollyweed... addictive stuff, ain't it?